Bob Sheppard, Jimmy Branly, Darek Oles, Jimmy Johnson and Walt Fowler join Mike Clinco performing 8 of his original compositions and one Henry Mancini cover. As a first-call support artist, you must be an adaptable and, of course, knowledgeable player, possessing a broad musical vernacular. Guitarist Mike Clinco transmits these attributes on his 2009 release, featuring a top-flight ensemble of proven jazz veterans. It’s easy to discern why Clinco has been summoned to perform with vocalists Bobby McFerrin and Natalie Cole amid sessions with the late operatic star, Luciano Pavarotti. Sparked by radiant horn choruses atop the guitarist’s largely melodic original compositions, the entire program looms as an exercise in good taste. Clinco often caresses a given theme via animated single note licks and a fluid delivery. His lines are not only breezy, but project a forceful mode of attack. Saxophonist Bob Sheppard and flugelhornist Walt Fowler serve as strong foils for the leader as they interweave storylines and render expressive solos. Clinco steps on the distortion pedal during “X Cue Says,” where Sheppard’s edgy phrasings on tenor sax portray a rather cheery gait, abetted by perky choruses and crisp accents. With other pieces, the band executes circular motifs, and spunky jazz waltz grooves, chock full of harmonious textures. In addition, Clinco uses an acoustic guitar on the sublime piece titled “Charade,” composed by his former employer Henry Mancini. The album is not about technical gymnastics. Clinco and his bandmates rev it up in spots, but the improvisational aspects are designed around various motifs and theme-building exercises. The release is a highly listenable gala, driven by the fact that Clinco makes his point sans glitter, glitz or excruciatingly long solos. One of the finest session guitarist in the Los Angeles area, Mike Clinco sculpts a sparkling modern jazz masterpiece with “Neon,” leading a stellar cast of artists that include saxophonist extraordinaire Bob Sheppard, Walt Fowler on flugelhorn, bassist Derek “Oles” Oleszkiewicz, electric bass man Jimmy Johnson and Jimmy Branly rounding out the cast on drums. Except for Henry Mancini’s “Charade,” which Clinco treats with a measure of grace and style, the selection of music are all original compositions penned with a progressive modern jazz slant. The disc kicks off with a mild and relaxing composition in “Bookends” featuring Clinco’s crisp chords on the electric guitar guiding the direction of the music and providing ample space for Sheppard’s fluid sax line. The title tune, “Neon,” is a bit on the melancholy side revealing a dark tone to the music but nevertheless manages to shine through as one of the better tunes. In contrast, Clinco’s “X Cue Says” opens up with a bursts of aggressive energy cut in a rich progressive jazz/rock style. The music returns to a more mellow mode on the delicate and sprawling “Daydream” providing bassist Oles with an opportunity to showcase his chops while Clinco and Sheppard share softer moments with light solos. One of the best pieces of the album is the warm Brazilian flavored “Amalgam” where Clinco takes to the acoustic guitar delivering one very sweet solo. The session ends with trumpeter Fowler weighing in with a solid solo performance on the finale “The rest Will Follow” completing a superb musical statement from Clinco. With the plethora of jazz guitarist releasing new music these days, it’s refreshing to hear the music of Mike Clinco’s “Neon,” for it’s sophistication, brilliant compositions and quality of musicianship—together elevating this recording to one of the elite jazz guitar albums of the year. Mike Clinco – NEON: This is my first listen to the mighty mellow images that Mike paintswith his guitar, & I can tell you – it won’t be the last. 8 of the 9 tracks are originalsfrom Clinco and the energy the group plays with (Bob Sheppard, tenor/alto saxand alto flute; Walt Fowler, flugelhorn; Darek “Oles” Oleszkiewicz, acoustic bass; Jimmy Johnson, electric bass; Jimmy Branly, drums & percussion) will impress you right away. The most impressive track (for my ears, anyway) for high-energy quotient was “X Cue Says” – this thing will make you strut right on down the walk, talkin’ th’ talk, no doubt, & Mike’s guitar will get you acquainted (right a-way) with what th’ buzz on th’ street is – this is one HIP track, & my favorite on the CD! If your inclined towards something a bit less “street-wise”, more sophisticated & groove-oriented, you’ll also dig on “Bookends”, the opening track. Though I imagine the album title was based on the brilliant palette of sonic colors that Clinco & crew paint for your aural enjoyment, it’s not as “flashy” as it might imply, rather a collection of 9 masterpieces that will stay in your ears for a long, LONG time to come… this gets a MOST HIGHLY RECOMMENDED, as well as the “PICK” of this issue for “best guitar-based jazz”. Neon is an engaging modern jazz album that showcases the diverse background and compositional approaches of Mike Clinco and his ensemble. While this record will fall into the category of modern jazz, the music on Neon draws from blues, rock, Latin and bebop as much as does from the post-bop idiom. In the hands of lesser musicians, blending these different styles might sound convoluted or incoherent, but Clinco and his quintet rise to the challenge and are able to bring out the subtleties of these genres while maintaining a unified ensemble sound throughout. All of the tunes, with the exception of one—Henry Mancini’s “Charade,” with whom Clinco toured for 14 years—were written and arranged by the highly-experienced Clinco. The material is thoughtfully arranged and never sounds like merely head charts, or vehicles to showcase the improvisational prowess of the band. Tunes like the opening “Bookends” and “Amalgam” contain some wonderful harmony lines between the guitar and horns during the melody sections, not to mention memorable solos by Clinco and saxophonist Bob Sheppard. One of the album’s highlights comes with “X-Cue Says,” where Clinco breaks out his distortion pedal, which not only adds a new level of texture to his guitar, but also provides inspiration for memorable solos by Sheppard and drummer Jimmy Branly. Clinco’s playing is solid throughout as both a soloist and accompanist. Hardly a tune, or sometimes a section of a tune, goes by without Clinco changing the tone or texture of the guitar in both the lead and/or comping. These changes of texture are furthered by his use of both electric and nylon string guitars. Clinco’s haunting intro to “Charade” is a fine example of his nylon playing. Here, through the use of overdubbing, Clinco plays both the melody/solo and chords on his nylon string. While many times the overdubbing of two guitars can sound forced or uncreative, Clinco manages to convincingly portray the sound of two guitars without drawing attention to the fact that he is playing both. Neon is an album as diverse as the musicians who recorded it. It highlights the variety of backgrounds that Clinco draws from in his playing and writing, as well as the world-class ensemble that he has chosen. Not a fully composed work, nor a blowing album, Neon is a welcomed mixture of composition and improvisation. Although guitarist Mike Clinco has been hard at work for a quarter of a century, the well-rounded musician is not well known in jazz circles. Hopefully, Clinco’s latest project, the sextet outing Neon, will garner him some new fans and accolades. The nine-track release is an agile amalgam of contemporary and smooth jazz, rock influences, and some Latin inclinations. Clinco has worked extensively with a veritable who’s who of American music, including but not limited to Nelson Riddle, Bobby McFerrin, Henry Mancini, and Natalie Cole. Clinco’s backing band has equally skilled pros. Walt Fowler has toured or recorded with Frank Zappa, Ray Charles, Stanley Clarke, and several more artists. Bob Sheppard currently is part of The Peter Erskine Trio, has hit the concert stages with Chick Corea, and has session credits too lengthy to list here. Darek “Oles” Oleszkiewicz studied with Charlie Haden, and played with Pat Metheny, Joe Lovano, and many others. The versatile Jimmy Johnson’s talents have been utilized by Sergio Mendes, James Taylor, Alan Holdsworth, and various other musicians. And Cuban Jimmy Branly has helped Airto Moreira, Gonzalo Rubalcaba, Alan Pasqua, and lots more. With a crew like that on hand, Clinco certainly has an efficient ensemble that contributes experience and ability. While Neon showcases top musicians pooled into a singular unit, more importantly the record displays Clinco’s leadership aptitude, planning and performing expertise, and songwriting craft. Except for an introspective rendition of Mancini’s “Charade,” the music is Clinco originals. Neon opens with the upbeat, amiable “Bookends,” which features melodic guitar and tenor sax interaction. The radio-friendly arrangement restlessly advances, with repeating riffs, a guitar/tenor sax section, and a Clinco guitar solo which acts as an appetizer of what he can do. However, Clinco is not flashy, and donates the larger spotlight to Sheppard, who steps up and quickly establishes his capacious saxophone proficiency. “Sonship,” a neighborly contemporary jazz piece, immediately follows and traces a similar blueprint. The song includes a few gregarious meter modifications, another blithe Clinco solo that has a zestful economy, and short Sheppard solos that sparkle. Johnson and Branly also present a facile rhythmic interplay. While the title track does not deviate far from the previous two numbers, it has a moderately darker, nighttime hue, some Spanish-tinted spice revealed via Clinco’s six-string excursion, a deft Johnson bass solo, and nearly four minutes in, a burnished and lucid Sheppard sax exposition. Clinco shifts the program’s tone on “X Cue Says,” which enters fusion territory. Clinco creates a rock-oriented framework with his tough-timbered guitar, while Branly rollicks with a driving back beat and Johnson lays down a deep electric bass intonation. While Clinco often remains firmly in the middle space, Sheppard forcefully takes front stage, producing one of his strongest and fiercest offerings on the compact disc. The generally easygoing and harmonious “Beaten Path,” accented by Sheppard’s balmy alto flute, also has a rock-based characteristic, demonstrated by a stout midsection that exhibits Clinco’s affection for guitar icons like Pink Floyd’s Dave Gilmour or Carlos Santana. Clinco and company show a somber and serene mood on “Daystream” and Mancini’s “Charade.” “Daystream” has distinguished phrasing and meter changes that keep the otherwise shadowy piece inviting. Oleszkiewicz filters the tune’s overlying dimness through an attractive acoustic bass solo. Clinco and Sheppard match the melodically patient temperament with solos that parallel the overcast atmosphere. The most meditative moment occurs during Clinco’s unadorned and pleasant translation of “Charade,” which he performs as an overdubbed duet employing two acoustic guitars, done in a pop-jazz style reminiscent of Earl Klugh or Chet Atkin’s jazzier material. Neon is not a garishly colored effort. Rather, the nine compositions share a commercially genial approach, with adroit solos and subtle alterations in meter or phrasing without extremes or caustic intensity. While this benefits Clinco’s musical personality and garnishes Neon with an engaging warmth, some listeners may find some of Clinco’s music slightly horizontal or too uniformly well mannered. Overall, though, this is an enjoyable session. 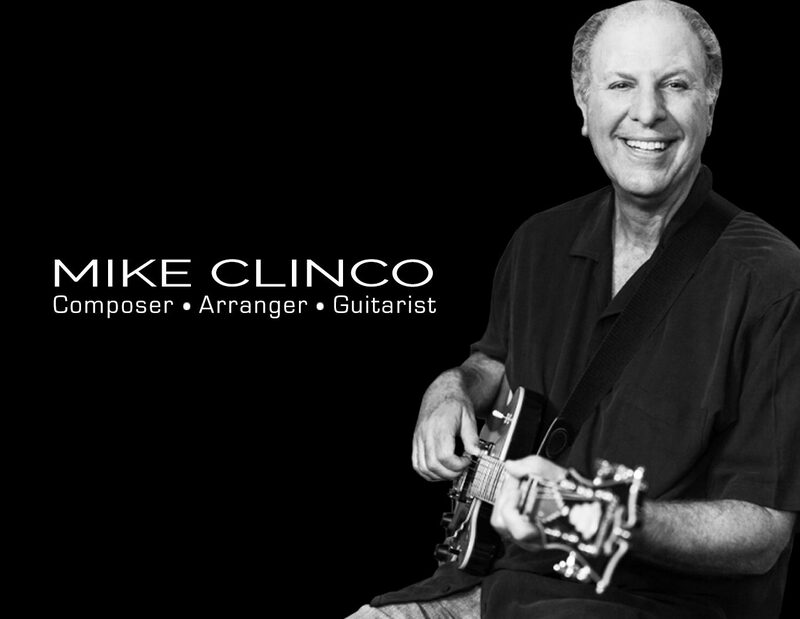 L.A. based guitarist Mike Clinco is well known in the music biz as a session guitarist for many films and television shows as well as a touring musician people such as Bobby McFerrin, Luciano Pavarotti and Natalie Cole. For this recording, he has rounded up an amazing collection of veteran musicians, all of whom have been connected to famous musical names inside and outside of jazz. This is an amazing piece of work…Clinco has penned all of the songs with the exception of “Charade”…and the musicians play this work as easily and familiarly as though they were musical standards from days gone by. The music feels like an old friend you want to have with you all the time. It’s not smooth or bland; it challenges you without being improvisational or self-indulgent. Clinco was his own producer on this recording and he has done a great job in this role as well. The music seems to flow like a particularly fine wine. The musicians all know their place on the imaginary stage and they play in a disciplined, skillful fashion. The recording itself is so well balanced across the stereo spectrum that every instrument comes through loud and clear. I especially liked the name of the CD. “Neon” evokes endless city streets, the colours running on the pavement, the epitome of urban cool. Summary: A gem. Buy this and amaze your friends. Composer and jazz guitar extraordinaire Mike Clinco certainly has a passion for melodies, which is evident throughout all of the tracks on Neon. An impressive musician in his own right, he assembled an extraordinary band for this project that transforms smooth, often deceptively simple melodies into a treat for the ear. Regardless of whether or not you know anything about jazz, Neon’s nine instrumental tracks deliver a pleasing experience that will leave you simultaneously satisfied and wanting more. Clinco’s modus operandi is to keep it simple: a rhythm section keeping the beat in the background while typically two wind instruments take the melody. The middle is for solos, often more than one, usually at least one by guitarist Clinco himself. The style is smooth and laid back, allowing the listener to sit back, relax, and just enjoy the music. “Bookends” is the perfect start to the album. It’s upbeat, beginning with staccato chords leading into a melodic progression, featured on guitar and tenor sax, that becomes increasingly more complicated. The opening riff is repeated, followed by another guitar/tenor sax verse, a refrain of the main hook, and a guitar solo. As the solo progresses, Clinco gives the listener a small taste of exactly what he can do, although just when he gets into showing off he hands over the spotlight to the tenor saxophone player, who is much quicker to embellish and showcase his own vast talent. The song ends as it should: with Clinco improvising in the background while the rest of the band plays the main hook. All in all, it’s a pleasing tune that functions as just a tease as to what this group of musicians is really capable of. A standout track is “Daystream,” a slower tune that once again features the saxophone and guitar. This more mournful ballad is full of emotion and passion, driven by the saxophone. The shining moment on this track, however, is the acoustic bass solo. While it’s not very long, it gives the song something different, maintaining the blues feel without the mournful cry of the tenor sax. While the melodies are great, Neon would really be nothing without all of the solos. Clinco and his crew are all extraordinary musicians who have put together a great collection of songs to listen to when you just want to relax. Mike Clinco has been hard at work for 25 years now as a composer and guitar player. On Neon, a nine track recording, Clinco firmly establishes his presence in the jazz community as a force to be reckoned with. Neon is equal parts contemporary and smooth jazz sprinkled with rock and occasional Latin influences. All the tracks except “Charade” are originals. Clinco’s excellent leadership and infinite musicianship help to drive Bob Sheppard (tenor & alto sax, flute), Walt Fowler (flugelhorn), Derek “Oles” Oleszklewicz (acoustic bass), Jimmy Johnson (electric bass) and Jimmy Branly (drums and percussion) to high levels of execution with their instruments. Not to say they need a push, Clinco simply inspires them. All of them are excellent complements to the amazing guitar runs that he manages throughout this CD. The title track has some amazing bass lines in it, which was the one thing that I caught on to quicker than everything else for some reason however that was the only track that my focus was jarred from Clinco’s impressive six-string manipulation. “X Cue Says” is a marvelous example of clear and concise guitar lines while “Beaten Paths” is a stage for the versatility and genre flip flopping that makes Clinco a player to be admired and respected by his contemporaries and adored by fans of instrumental jazz. “Beaten Paths” is on fire with rock, jazz, and Latin riffs peeled off in several layers to suit each part of the composition. It finds a way home to the finish line triumphantly, taking complexity and turning into simplicity. This is a masterstroke of pure musical genius at work. I was amazed at the fluidity and craftsmanship of Clinco on this track more than any other. I highly recommend Neon to jazz listeners, guitar players, and those in the industry that are looking for tracks suitable for several types of media that need a soundtrack. In the end regardless of these facts, this is a great jazz album featuring a player that everyone should listen to. He takes guitar playing to another level rarely attained. MIKE CLINCO/Neon: One of those nifty jazz guitar tour de force albums, Clinco takes you on an impressionistic tour of his mind as he sonic paints a wide variety of scenes and styles for your head movie projector to screen. With a passel of right on pals on board, Clinco delivers in only a way that a cat that has played with everyone that matters can do and still keep it in perspective. A warm date that covers the base well, it’s time that Clinco steps out of the shadows for the masses and really take the spotlight to strut his delightful stuff. Of all the small jazz band combinations I’ve always found the guitar led ones to be the most intimate type when listening to them on home audio. And that is reinforced by this new album by guitarist Mike Clinco. Neon showcases the guitar, both acoustic and electric, in that intimate way, with a series of nine tracks which expertly highlight what can be done with a guitar in a variety of settings. It isn’t all about raw volume and effects peddles, the subtle approach is much more rewarding. The album starts with Bookends, a swingy number which certainly acts as a great intro to this musician and his band. The other musicians involved are Bob Shepherd – reeds, Walt Fowler – flugelhorn, Darek Oleszkiewicz – acoustic bass, Jimmy Johnson – electric bass and Jimmy Branly on drums. All the tracks except for Henry Mancini’s Charade were written by Mike Clinco, and they all share the knack of drawing you into what can be a lengthy soundscape. I suggest trying the title track, Neon, as an example of this. On many of the tracks there is a dual dialogue between the guitar and saxophone which is very attractive sonically, and for some reason I keep flashing onto old TV detective shows that used a jazz soundtrack!?!. Apart from that, this is an album of many moods and sounds and is an excellent showcase for those musicians. I also suggest that guitar novices listen to this album before they pick up any bad habits… In many ways Neon is an impeccable jazz album – restrained and packed with musicality. Of all the small jazz band combinations I’ve always found the guitar led ones to be the most intimate type when listening to them on home audio. And that is reinforced by this new album by guitarist Mike Clinco. Neonshowcases the guitar, both acoustic and electric, in that intimate way, with a series of nine tracks which expertly highlight what can be done with a guitar in a variety of settings. It isn’t all about raw volume and effects peddles, the subtle approach is much more rewarding. The album starts with Bookends, a swingy number which certainly acts as a great intro to this musician and his band. The other musicians involved are Bob Shepherd – reeds, Walt Fowler – flugelhorn, Darek Oleszkiewicz – acoustic bass, Jimmy Johnson – electric bass and Jimmy Branly on drums. All the tracks except for Henry Mancini’s Charade were written by Mike Clinco, and they all share the knack of drawing you into what can be a lengthy soundscape. I suggest trying the title track, Neon, as an example of this. On many of the tracks there is a dual dialogue between the guitar and saxophone which is very attractive sonically, and for some reason I keep flashing onto old TV detective shows that used a jazz soundtrack!?!. Apart from that, this is an album of many moods and sounds and is an excellent showcase for those musicians. I also suggest that guitar novices listen to this album before they pick up any bad habits… In many ways Neon is an impeccable jazz album – restrained and packed with musicality. O’s Notes: Guitarist Mike Clinco has a wealth of experience and has played with a virtual who’s who in the jazz arena. Bob Sheppard (fl, cl), Walt Fowler (t), Darek “Oles” Oleszkiewicz (acoustic b), Jimmy Johnson (electric b) and Jimmy Branley (d) form the rest of the band. Clinco wrote most of the material and produced an enjoyable set. It’s relaxed, swinging fusion that won’t give you a headache! They vary the pace and mood making repeated listening enjoyable. Among our favorites are the title track and “Amalgam”, a jovial tune with a bossa nova feel.